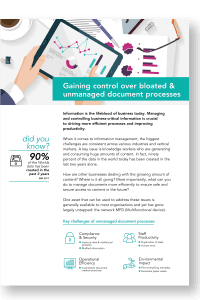 Managing and controlling business-critical information is crucial to driving more efficient processes and improving productivity. How are other businesses dealing with the growing amount of content? More importantly, what can you do to manage documents more efficiently to ensure safe and secure access to content in the future?